Spoilers: I am not going to spoil the plotline. I will be spoiling the gameplay mechanics. If you're planning to play the game, however, you may want these spoiled for you. I swear, it took me a week to figure out what I wanted to say here. I keep notes on games as I play them, y'see. Anything that annoys me, anything that impresses me, any thoughts I have, it all goes into the notes. Eventually I finish the game, and I write up a dissection based on my notes. Patapon has more notes than every single dissection you've seen so far put together – as well as two you haven't. To say that I am divided on this game would be an understatement. 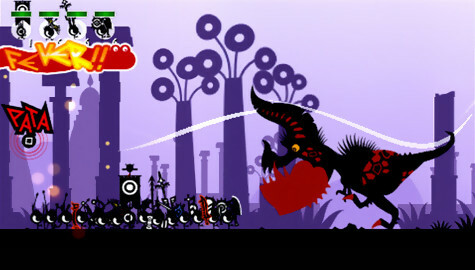 Patapon is a sidescrolling rhythm game. You control a bunch of little mobile eyeballs with weapons named Patapons, and you "control" them in a moderately indirect manner that takes the form of a rhythm game. You have a set of "commands", and if you punch in the commands with the right rhythm, your little eyeballs do things. 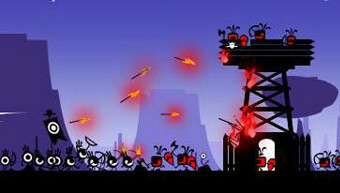 Once you finish a level – whose goals are virtually always either "get to the end of the level" or "kill a boss" – you are returned to the Patapon Village, where you can play various minigames, buy and upgrade Patapons, and go out to a new level. First off, the game is pretty – I mean, look at that picture up there, that's almost exactly what the game looks like. You fight giant enemies, ten times the height of any of your warrior eyeballs, weapons visibly stick in them as you fight, the animation is brilliant, etc etc etc I don't really have a lot to say about the graphics besides "yum". It's worth buying just for the awesome visuals. Besides that, though – Patapon has issues. Big, humongous issues. And it took me days to figure out why. First off, your units do not have a vast repertoire of abilities. They have, for example, "move right", and "attack". They can also "defend", "run away", and "charge up the next attack". You'll never use "charge". You may notice this gives you four useful abilities . . . in the entire game . . . and you would be exactly right. You will be doing those four things over and over again. There's one more ability – "magic" – but to be honest you'll use that one perhaps twice in the entire game. You see, it ends Fever Mode, and that's something you never want to have happen. So there's the first problem – there's no variety. Fundamentally you just don't do many things in the game, and you do them over and over again. The next problem is Fever Mode. 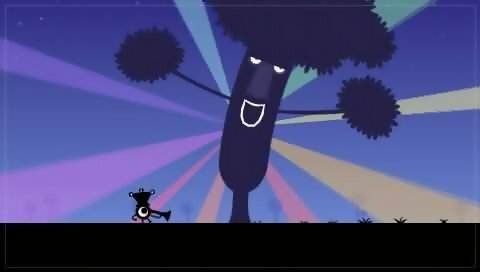 Patapon is, as I mentioned, a rhythm game. Each of the abovementioned "attacks" is four drum beats, which you press in rhythm. If you get the rhythm right, consistently, then your Patapons eventually enter "Fever Mode" and become useful. Yeah, read that again. If they're not in Fever Mode they are basically useless. Archer units fire three times as many arrows in Fever Mode and I think each of them does more damage. Mounted units gain the only ability that makes them worth bringing along. Units run away faster and go further – without Fever Mode they kind of run away, a bit, and then get stomped by the huge range of the enemy you're currently fighting. Their defense gets stronger, their speed goes up, everything your units do is vastly improved, with the end result that your performance is directly correlated to how long you can maintain Fever Mode. And Fever Mode is a fractious, unruly beast-queen. The manual is unclear on how it starts and ends. Sometimes you'll enter it after a mere three commands, sometimes it will take ten. Sometimes you'll have no trouble staying in it for long periods of time. Sometimes it will end for no obvious reason, even when the commands seem to have been input correctly. A frustratingly large amount of the time it will end on the very next command after you enter it. The timing that you need to push buttons is extremely tight, and there's no visual or auditory clue as to whether you're too early or too late. There is an auditory clue as to how close to the beat you are, but it's subtle and if you start concentrating on it you're almost certain to miss your timing a little bit – which sort of defeats the point of concentrating on it. On top of that, the mechanics involved with Fever Mode are byzantine and complicated, and never explained anywhere. More than once, especially at the beginning of the game, you'll be fighting a boss, and you'll think "oh, maybe I will beat him this time!" and then you'll drop out of Fever Mode randomly and get slaughtered. Yes, there are bosses that will one-shot your entire army. Unless you're in Fever Mode, of course. And to cap things off, there's the Patapon Village. You can buy new Patapons, but apparently randomly you'll get a different kind of patapon – maybe one with bunny ears that can't use armor? Maybe one that looks like a hedgehog! Or, hey, this one has angel wings. Unless you're extremely observant you're just not going to figure out what causes different Patapon types until you – like me – go and check a walkthrough. It took me about a week to figure out what the underlying cause to all of this annoyance was. There's a concept I've heard of which is occasionally called an "expert interface". The idea is that it's an interface designed explicitly for experts to use it – not for novices. A lot of professional 3d software has this sort of interface – it has a grueling, brutal learning curve, but once you learn it you're able to work incredibly fast – far faster than you would be able to work with a "novice interface". Often these interfaces include many byzantine and inexplicable key combinations, and every aspect of them is chosen for speed of work rather than intuitiveness. Patapon is an expert game. The game isn't designed for newbies. It isn't designed for casual gamers. It's designed for people who are willing to sit down and absolutely master the interface, and it's designed to still give them a good gameplay experience once they do so. Experts don't need to be told whether they were just a little too fast or a little too slow on a button-push – they just know. Experts know that dropping Fever Mode is probably death, and they just won't drop it. Experts will understand the nooks and crannies of the interface and, honestly, probably won't even notice them. Patapon does a really good job of being an expert game. Once you figure it out – which takes quite a while, admittedly – it has amazing flow. Yes, there's only four things you'll realistically be doing, but it like you're coordinating the movement of all your little suicidal patapons rather than simply giving them orders. Enemy ahead! Pata pata pata pon! Attack! Pon pon pata pon! Keep attacking! Pon pon pata pon! Dodge, pon pata pon pata! Pata pata pata pon! Pon pon pata pon! Chaka chaka pata pon, pon pon pata pon, pata pata pata pon, pon pon chaka chaka, pon pon pata pon! And that's when the game shines – when you're no longer fighting with Fever Mode, when you're not trying to decipher what the hell a "Mofeel" is and where it came from, when you're just assaulting these ridiculously gigantic and fantastic monsters with your army of little eyeballs. It's worth talking about Expert Games a little more, because I expect that this is going to come up again. 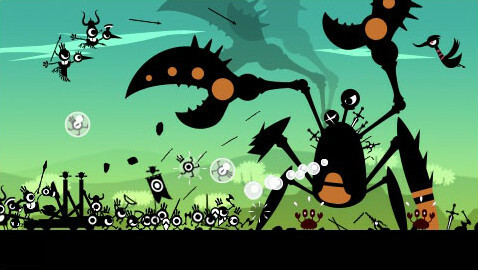 I don't think the people who made Patapon intentionally made an expert game, because if you intentionally make an expert game, you generally think to include a good detailed tutorial. Accidentally making an Expert Game is unfortunately easy. It's a common trap to fall into in game design. The game is yours, therefore you know everything about it. The mechanics are clear to you (since you know them all by heart) and therefore you see no problem with learning them. You can make a game which is fun, balanced, and polished, and then release it to the world and . . . nobody can figure out how to play it. This is, incidentally, sometimes I've tangled with constantly in Devastation Net. Devastation Net is an expert game. You're meant to get to the point where you fundamentally know the weaponry, and where you fundamentally know the abilities of tanks, and that is when the strategy takes place. Partially I'm trying to solve this by making all of the game balance numbers available to you, and in your face – move the cursor over a tank, you instantly see how tough it is and how fast it is. Choose a weapon and you should quickly see how it works. Partially, though, I'm having trouble with the learning curve, because teaching people things is hard, especially when it's an uncommon game style. Unfortunately it's really not something game designers have much experience with in multiplayer games. Generally, the way you teach the game to someone is you lead the player through a single-player campaign that unlocks things one step at a time. That just doesn't work with a multiplayer game. I'm still trying to find a good solution, to be honest. I've rambled on long enough at this point. 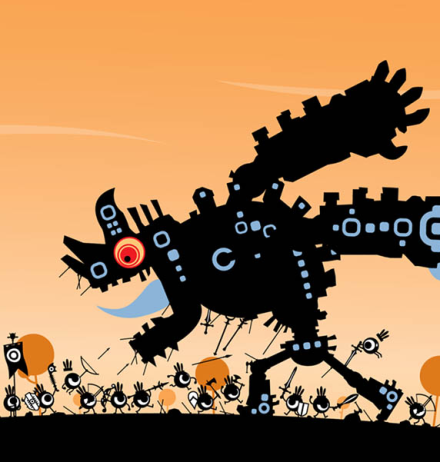 Patapon is a beautiful game. It is also a fun game, once you get past the initial learning curve. Don't be afraid to check a walkthrough on this one – read everything except the mission descriptions, and you'll be thankful. I never said it actually was magical, merely that it felt that way :) Until you figure out the details on how it works it's entirely possible to end up simply confused – for example, it's possible to get into fever mode with a certain level of timing, but then you immediately lose it again with that same level of timing. That's just plain weird. Things like that make the game significantly less fun. And yes, you get it eventually, but it hurts the game substantially.